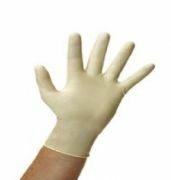 Here you can browse our disposable gloves catalogue of latex gloves, nitrile gloves, vinyl, poly and household rubber gloves. Our gloves are all available in various sizes, small, medium, large and extra-large and you can choose powdered gloves or powder free gloves. Whether you want to order one pair of rubber washing up gloves, a box of nitrile gloves or a bulk order for a pallet load of blue latex gloves we can facilitate your order quickly and efficiently. If you are unsure of which size of glove to order you can check our glove measuring guide and chart here for correct glove sizes. All our surgical gloves are AQL 1.5 Standard.